There’s a limited number of restaurants open late on New Year’s Eve in Reykjavik that won’t break your budget, so make a reservation ASAP if you’re planning on splurging on a nice dinner, so you don’t end up scrounging pre-made sandwiches from the supermarket for your dinner at 1am (like we did). Most stores will be closed early on New Year’s Eve, so if you plan on buying food, drinks (that aren’t alcohol), shop ahead. Buy your alcohol at the airport duty-free. Alcohol is expensive in Iceland. As soon as you arrive into the airport in Iceland, I strongly recommend buying your alcohol for the trip. Bars are also pricey, so if you’re looking to visit Iceland on a budget on New Year’s Eve, I recommend stocking up and enjoying a night mostly in. Hard liquor and good beer must be bought at the Vinbuð store, which has limited hours, so check the hours the day before if you want to buy champagne, wine, and beer. Alternatively, shop duty-free when you enter Iceland! 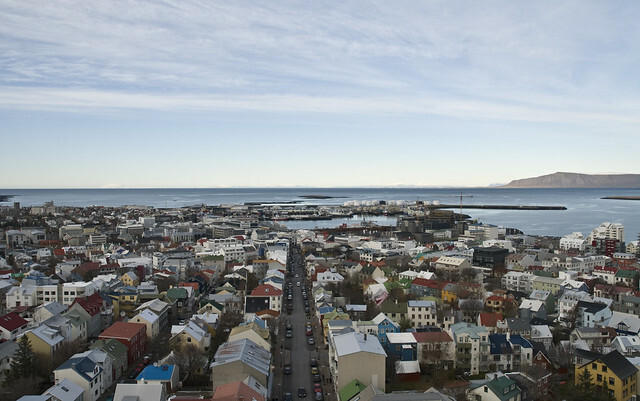 Accommodations in Iceland on New Year’s Eve will be expensive. We stayed at the B47 hostel , which meant that we had our own private room although there was a shared social area. We ended up meeting a group of friendly Albanians who definitely encouraged us to visit while teaching us traditional Albanian songs. Fireworks are banned majority of the year in Iceland, however fireworks are legal for the week around New Year’s Eve (December 28nd to January 4th) as the profits benefit the Icelandic Association for Search and Rescue, which is an independent organization of volunteers who man search and rescue missions across Iceland. (Simply, if you get lost in the wilderness after disobeying locals’ instructions not to go, these heroes might still come for you multiple times… Side note: If a local expert tells you that something is a terrible idea, don’t do it.) You can buy your fireworks around Iceland easily. 10:00am Go shopping for supplies! If you’re on a budget in Iceland, you’re better off not eating out on New Year’s Eve in Reykjavik as it’s expensive and hard to get a reservation. Head to the supermarket instead. We were able to book a tour to go snorkeling in Silfra on New Year’s Eve in between Europe and North America. It was a magical experience–and a epic way to end the year. There’s nothing like floating in almost freezing water to wake you up in the morning. Many other tours were not running on New Year’s Eve in Iceland, so check carefully and double-check with the tour company as one tour that I tried to book got canceled after they realized December 31st was open despite all the tour guides being off for the day. I had to scramble to find a new tour. I strongly recommend napping after getting a hearty lunch as it will be a long night. The fireworks in Reykjavik on New Year’s Eve will be going off all night, so be warned that sleeping will be tough anyways. If you’re planning on staying out partying until 5am, you’ll need a solid nap. 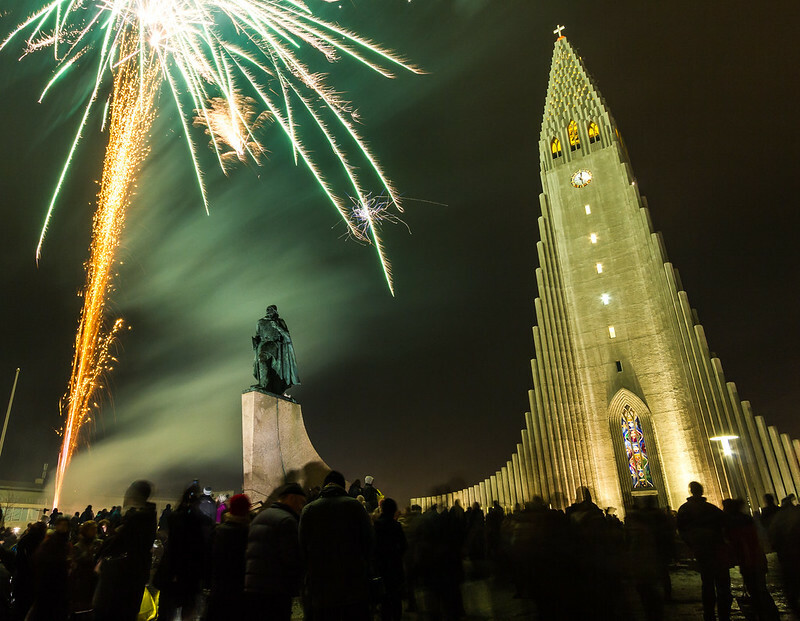 The best things to do in Iceland on New Year’s Eve to attend one of the bonfires, which are an old Icelandic tradition that (some say) date back to pagan time. Some say that it helps to cleanse the old year before the new year comes. Either way, these massive bonfires are family-friendly traditions where you’ll be able to celebrate with local Icelandic families and tourists alike. Also, be warned that parents like to give their kids fireworks. Leave early to arrive at the bonfire before it’s lit and to get a good place to stand! The bonfires in Reykjavik (as well as around Iceland) vary in size and popularity, however it’s good to check the hours ahead as most start at 8:30 promptly. However, a few have different schedules. That said, you don’t need a tour to attend your nearest neighborhood bonfire as they’re free and walking distance from the main attractions. This is a map plotting out the neighborhood bonfires in Reykjavik on New Year’s Eve. We attended the bonfire on Ægisíða street in Vesturbær neighborhood, which is along the beach. I found the up to date list published about a week before in the local Icelandic newspaper, but luckily you can also find this information online. Just check that the resource was updated. If you’re celebrating New Year’s Eve in Iceland, but not in Reykjavik, you should be able to find a bonfire near you if you’re in a major Icelandic city. I recommend bundling up as the wind coming off the water is cold–and you need to be dressed warmly as you’ll be standing around for at least an hour. (Click here for my Iceland winter packing list on a budget. )There will be limited toilets, so use the bathroom before you go. Everyone will leave before 10pm to not miss Iceland’s equivalent of SNL (Áramótaskaupið) on television. It’s a Icelandic yearly tradition to watch this show. (We tried to watch it with captions, but we weren’t really getting the jokes.) Instead, you can relax, nap, or get bundled up for the big event! People will already be starting to set off fireworks, but there’s something magical about the fireworks in Reykjavik on New Year’s Eve set against the background of the church. There are warmer places to go, but if you’re on a budget, you’ll also get to see lots of unofficial fireworks…even before midnight.Just a note: It will be cold in Reykjavik and it may be icy (there are hills), so choose your shoes carefully! I ended up wearing a warm winter dress with my thermals underneath with my snow boots! 12:00am Happy New Year’s In Iceland! At midnight on New Year’s Eve, Reykjavik becomes a firework war zone amidst the champagne and kisses. 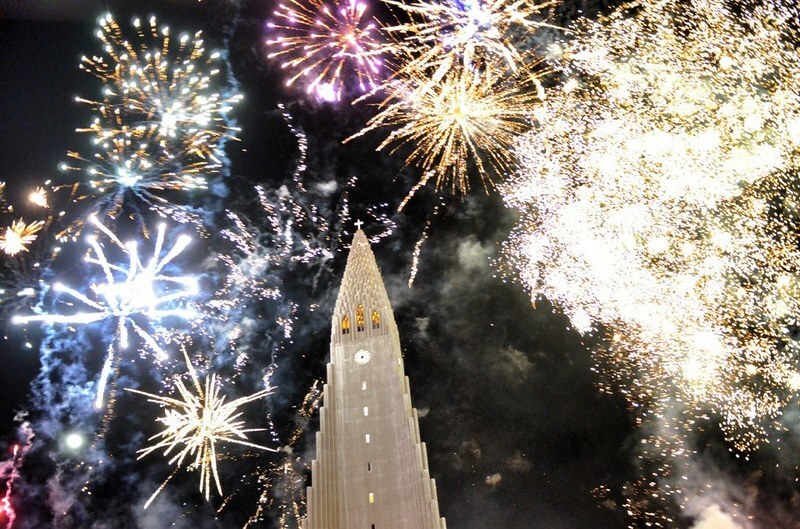 Just be aware that you might see some near misses like the rocket that I definitely saw shatter someone’s window or the firework bounce off the Hallgrimskirkja. I also inhaled quite a bit of fireworks …and smoke. (If you want to come super prepared, get a face mask.) If you’re lucky, you’ll get invited to one of the many house parties on New Year’s Eve. Afterwards, most people (especially tourists) will descend upon the downtown area for going to the bars and clubs. Reykjavik is full of great bars and clubs although I recommend preparing for the shell-shock of the price. I paid about $20 USD for one cocktail. That said, I left the bar after one drink as Iceland on New Year’s Eve is expensive enough and we had our own beer in our hostel. We headed back to our hostel where we kindly donated our leftover beer to the people celebrating at 4am in the common room. Happy New Years Eve and I hope you all have a blast celebrating the new year in Iceland! Looking for more about Iceland in winter? I wanted to go spend NYE in Reykjavik this year so bad! Sigur Ros are taking over the Harpa concert hall for a few days between Christmas and NYE and I wanted to stay for a few days after that. Unfortunately ticket prices were insane… Maybe another time! When I arrived in Iceland for my semester abroad in 2010, the fireworks were still going (I think it was jan 3), but the Christmas lights and decorations were out for at least another month! I love that time of the year in Iceland! This brings back good memories of my NYE there. However, I missed the bonfires because I was drinking so much at a restaurant that I lost track of time! LOL. The fireworks at the church were insane!!!! Great post!!! This is super helpful. We are heading over there on the 30th and will be in the city for NYE! Very much looking forward to this!